And all of those are legitimate requests. Real, true, vulnerable, and necessary. But I get tired of praying the same thing all the time. It doesn’t stem from doubt or lack of creativity. I say the same things because I still want my kids to do well. I still want Katie to be healed of her migraines. I still want God to bless my husband at work. Some people I know are still sick, and may always be. Unfortunately, there are some lessons I may never learn; some trials I may never overcome. I will always want to know God more; I will always fall short; I will always be in need of His grace and His hope and His peace. So I end up saying the same ol’, same ol’. And even if I thought God wanted to hear the same thing a thousand times, I know I don’t want to say it a thousand times. Jesus said, “When you pray, don’t babble on and on as people of other religions do. They think their prayers are answered merely by repeating their words again and again” (Matthew 6:7, NLT). In the past few years, through the process of writing Praying Upside Down and Designed to Pray, I’ve learned a lot about prayer. That there isn’t really a right or wrong way to pray; if you pray, if you simply approach God, you will be changed. The power is in the One we seek, not in the questions we ask. The answers we’ll get are often surprising. Prayer is nothing more than a conversation. You probably already know these things. 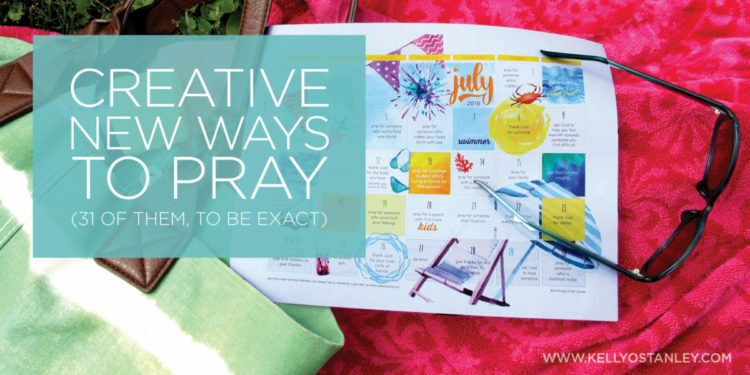 But if we’re supposed to pray without ceasing (1 Thessalonians 5:17), how do we do that without being like a record player whose needle is stuck in a rut, playing the same phrase over… and over… and over… until we’ve lost our ever-loving minds? The Bible tells us this: “Don’t worry about anything; instead, pray about everything. Tell God what you need, and thank him for all he has done. Then you will experience God’s peace, which exceeds anything we can understand. His peace will guard your hearts and minds as you live in Christ Jesus” (Philippians 4:6-7, NLT). Hmm. We’re supposed to pray about everything, to pray at all times—because it is through prayer that we develop and sustain a relationship with God. It is through prayer that we learn about Him, learn to love the way He loves, learn to see the needs all around us. But it is also true that we encounter all kinds of obstacles—shame, anger, frustration, impatience, grief, and boredom. My stock advice is this: if you find yourself in a rut, try something new. Because God is unlimited, and the ways He reveals Himself are without boundaries. 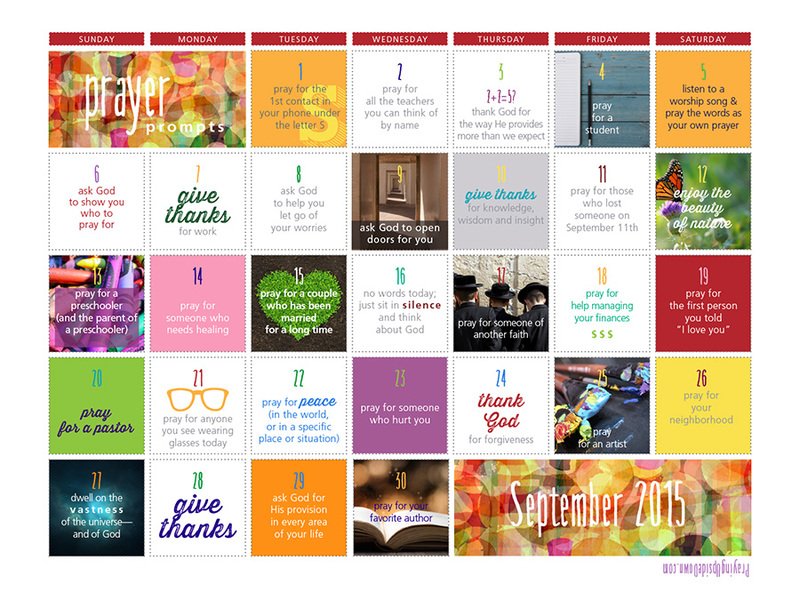 Maybe my prayer prompt calendars will help you approach God from a different angle. Our God never changes, but there are countless facets to who He is—to all that He is—so when we explore another facet, we grow closer to Him. We learn more. 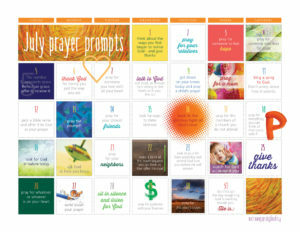 These prompts are designed to be fun and to remind us that there are all kinds of things we can pray about that we might not normally think of. Like our childhood best friend. A woman in high heels or a man who works the night shift. A celebrity or a utility worker. Someone who can’t have a baby, and another person who has four. They encourage us to keep our eyes open as we go through our days, to pay attention to the people God puts in our paths and to offer them up in prayer—because there are no limits to the needs we’ll encounter, and no limits to the answers God will offer. The calendars also incorporate praise and silence, to help us dwell on gratitude. To stir us to action sometimes instead of relying only on words. To think about others, but to know we can also pray for ourselves. Lord, thank you for this woman. Be with her as she goes through her day. Thank You for the job or event she’s going to, for the people in her life. Help her turn to you. Thank You for covering her with Your spiritual protection, for the fact that what Jesus did he did for all of us. We are all covered spiritually, forevermore. Thank You for protection from the elements, for warmth and security. For Your offer to clothe me in righteousness. Help me to wear the whole armor of God and to stand firm in my faith. Clothes cover us, but I also ask that You uncover what should not remain hidden. Let me release all my shame and sorrow, and not hold on to anything that is not uplifting and pure. And in place of those things, help me put on characteristics that will show people who You are, so that they will see You through me. Let me put on Your love and kindness and mercy and generosity. Let me live in Your holy presence. Thank You for always being here for me. Amen. But you don’t have to do this my way. Your prayers may look nothing like mine, and that’s okay—all that matters is that you try. That you reach out to God, that you consciously make room for Him in your life. Because when you do, your life will change. And you will be transformed. 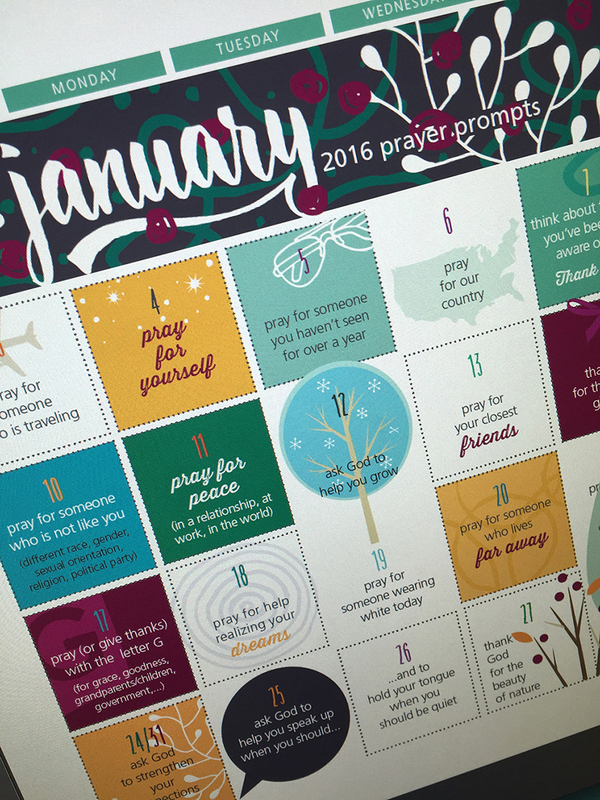 To download July’s prayer prompt calendar, click here. 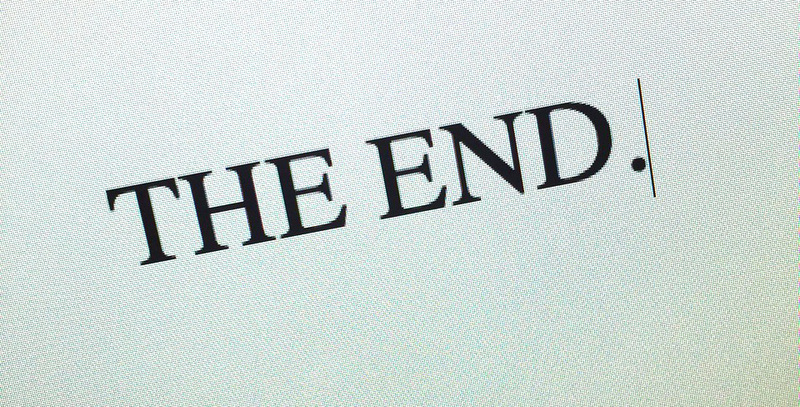 If you haven’t already subscribed to my e-newsletter, you will be asked to do so, and then all of my downloads will be unlocked for you. Near the end of each month, I send a newsletter to all my subscribers with a link to the prayer prompt calendar for the coming month. You’ll have plenty of time to print it and hang on your fridge, put in your Bible, or post on the wall by your computer where you will see it daily. 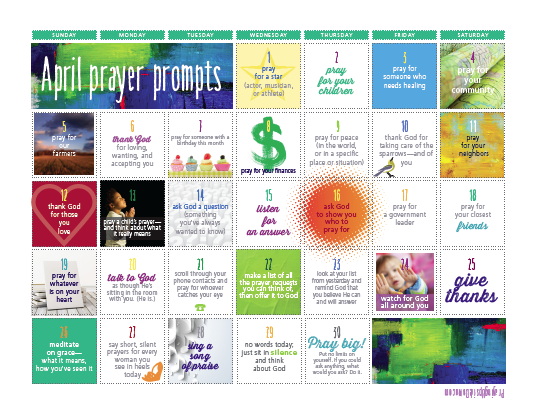 I wanted to let you know that a new prayer prompts calendar is available now for April—and these calendars are always free to those who sign up for my blog posts. I keep mine on my fridge and since I open it up many times a day (neither of us needs to admit just how many times we might open that door searching for snacks), it reminds me to pray. I’ve had a blast putting these together and I hope you’re enjoying them, too. As always, I’d love to hear any ideas you have for other printables I can create (or for future versions of this one). You can find the full-size calendar on my Products page. And stay tuned for more free downloads to come soon!